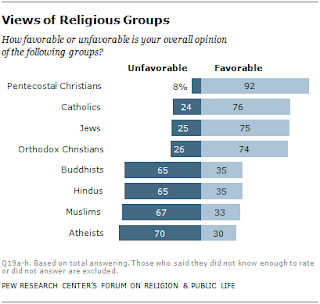 On the whole, the evangelical Protestant leaders express favorable opinions of adherents of other faiths in the Judeo-Christian tradition, including Judaism, Catholicism and Eastern Orthodox Christianity. 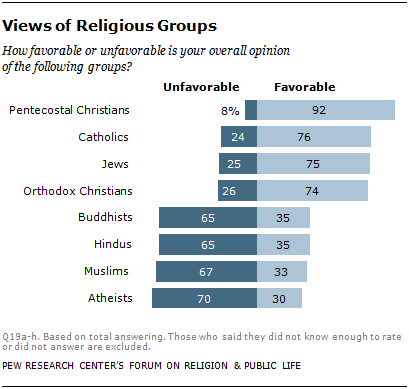 But of those who express an opinion, solid majorities express unfavorable views of Buddhists (65%), Hindus (65%), Muslims (67%) and atheists (70%). Interestingly, the leaders who live in Muslim-majority countries generally are more positive in their assessments of Muslims than are the evangelical leaders overall. Overall, most of the evangelical leaders report that conflict between religious groups is not a big problem in their home countries. Leaders in the Middle East and North Africa are most likely to say religious conflict is a moderately big (37%) or very big (35%) problem. About half of those in the Asia-Pacific region (55%) and sub-Saharan Africa (49%) also see inter-religious conflict as a moderately or very big problem. By contrast, in North America, Latin America and Europe, majorities say it is either a small problem or not a problem at all.